WASHINGTON (CNS) — Martin Marklin has been fascinated by paschal candles — the candles lit during the Easter Vigil at Catholic churches — since he was an altar server at Holy Cross Parish in St. Louis. As an 8-year-old, he was impressed by the candle’s intricate wax design. But years later he was surprised to see that the traditional paschal candle at his parish had been replaced by one far less artistic: one adorned with a mere decal. He learned that the woman who had been making them — carving out religious symbols on the candles and refilling them with colored wax — had died and no one else in the parish knew the craft. So in 1975, Marklin took it upon himself to create a paschal candle, turning his parents’ kitchen table into his workshop. Over the next few years he perfected inlaying melted wax into candles, so much so that he started his own business, at his parents’ suggestion, 10 years later. Today the company he and his wife, Christine, operate — Marklin Candles based in Contoocook, New Hampshire — is one of about seven companies making liturgical candles in the United States. He said his is by far the smallest and also the youngest and sells directly to churches unlike some bigger companies that sell to church suppliers. About 300 miles away in Syracuse, New York, the Steigerwald family continues a church candle-making business, Cathedral Candle Co., started by Jacob Steigerwald in 1897 who learned the trade in Germany’s Bavaria region. Both companies — one in its original city factory with 70 employees, and the other tucked away on New England farmland with 25 workers and its own bees to produce beeswax — practice an ancient craft and supply a key element to Easter liturgies across the country. Although candles have long played an important part in church services, the paschal candle is clearly the superstar. The word paschal comes from “Pesach,” the Hebrew word for Passover. The paschal candle, by church rule, is the biggest in the church space and plays a major role in the Easter triduum liturgy — symbolizing the Resurrection and the Christian mission to spread Christ’s light. The candle’s flame is lit and blessed outdoors at the start of the Easter Vigil and that light is passed on to candles held by those in the congregation who then proceed into the darkened church. Once the church is full, the lights are turned on for the reading or chanting of a special Easter proclamation, or Exsultet. The prayer refers to “the light which dispels all evil” and also credits the “work of the bees” and “your servants’ hands” in making the candle. The paschal candle is used during services throughout the Easter season and then only for baptisms and funeral Masses. Typical paschal candle designs include a cross, the Greek letters alpha and omega, and the year. Mark Steigerwald, who is a fourth-generation family member to work at the company, said he got his start during school breaks doing anything from preparing beeswax, sweeping floors or shipping candles. He said his great-grandfather was fond of his Catholic faith and was one of the early members of Assumption Parish, just a five-minute walk from the factory. 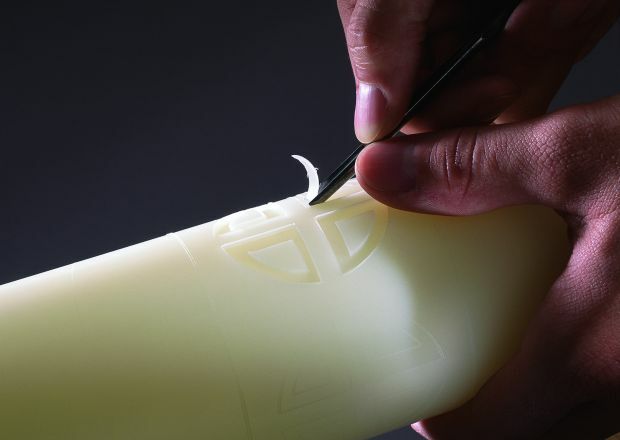 Lou Steigerwald, the company’s president, said his grandfather wanted to serve the church with his work, a principle that he said continues to guide their work today, which also includes production of altar, Advent and votive candles. 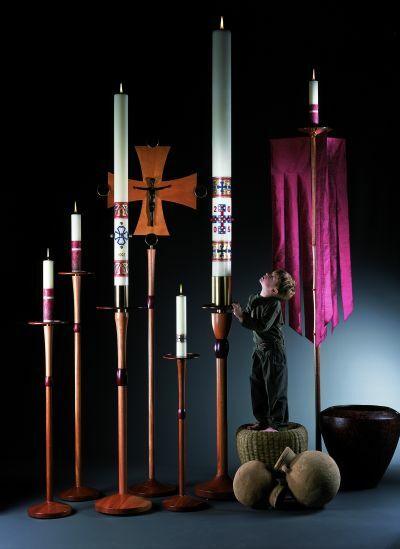 Marklin, who is a woodworker by training and crafts many of the wooden designs his company also sells, similarly can’t deny the deep spiritual connection to the liturgical candle-making craft. He said being an American manufacturer is rewarding in itself: “to turn raw material into something.” When the created product is artistic it has an added layer, he said, and then when it is used for worship, it has even more significance. “Yesterday 25 churches called for paschal candle,” he said March 18. But as he works almost around the clock to fill orders, he thinks about how tens of thousands of worshippers will be using these candles to visualize how the light of Christ overcomes darkness. “That makes the late nights and early mornings worth it,” he said.